Mountains rise straight from the sea. 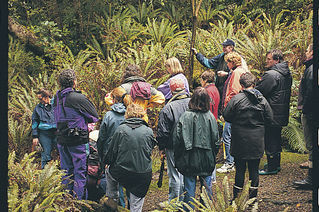 Lush rainforest, hidden waterways and a variety of native and endemic wildlife make an incredible wilderness. Our multi-day Discovery cruises will take you to fiords that are inaccessible by road and are virtually untouched by human hands. For five breathtaking days you will explore three of New Zealand’s most stunning fiords - Doubtful, Breaksea and Dusky Sounds. 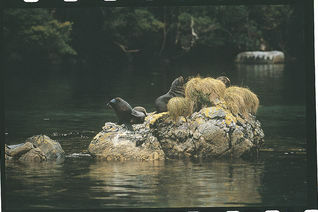 Doubtful Sound is spectacularly steep and is known for its wildlife, including fur seals and a resident pod of bottlenose dolphins. 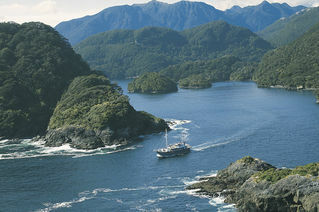 Further south, Breaksea and Dusky Sounds are two incredibly beautiful fiords. With more than 350 islands, they offer many idyllic spots for mooring and trips ashore. View the island sanctuary set aside by New Zealand’s first conservationist Richard Henry and follow in the footsteps of Captain Cook’s visit in 1773. We are also operating a "Dusky Sound Discovery Cruise (5 days) with one-way helicopter transfer". Just because you’re escaping civilisation doesn’t mean you have to go without its comforts. The vessel, the Milford Wanderer, is a modern motorised vessel that has been purpose built for navigating southern New Zealand. Designed along the lines of a traditional sailing scow, it has old world charm combined with modern facilities and the latest in safety equipment. All you need is an average level of fitness, a love of the outdoors and a sense of adventure. As a rough guide, you need to be physically fit enough to comfortably climb a flight of steep stairs. Meals: Hearty meals prepared onboard by chef.